The FISHER® SPEED-CASTER™ 525 and SPEED-CASTER™ 900 tailgate spreaders offer professional performance in any condition. These spreaders feature a 2-stage, auger-fed delivery system with independent control of material flow and spread pattern allowing you to put deicing material in the right place at the right time. Designed for tractors, SUVs and 1 ton or smaller pickup trucks, these tailgate-mounted salt and sand spreaders are fit for home use or commercial ice control in Reading. Enhanced, dual variable-speed control allows you to precisely match material delivery and spread patterns to conditions. Three standard accessory buttons and a dedicated blast button provide optimum in-cab efficiency. Easy-to-understand, digital self-diagnostics alert the operator when the spreader is empty or when adjustments are needed, and LEDs make the control easy to read. Its compact size compared to traditional controls fits easily into today's modern truck cab designs. Material is delivered by a heavy-duty steel auger to provide long-lasting, reliable performance. If an obstruction occurs, the transverse auger system will reduce downtime by automatically reversing until the obstruction is cleared and then normal operation will resume. The SPEED-CASTER™ 525 tailgate spreader features a 10" spinner made of nylon/glass reinforced resin, and delivers a spread pattern of up to 30'. 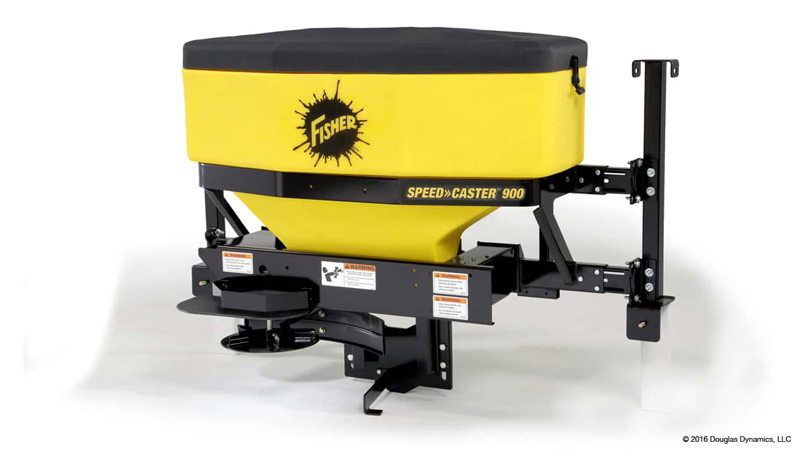 The SPEED-CASTER™ 900 tailgate spreader features a 12" steel spinner (shown) and delivers a spread pattern of up to 40'. The SPEED-CASTER™ 525 tailgate spreader comes standard with a combination 2" receiver hitch and 3-point tractor mount for use on multiple vehicle types. The SPEED-CASTER™ 900 tailgate spreader* requires the additional purchase of one of the available mount options: a pivot mount, a 2" receiver hitch mount (requires additional adapter), or a 3-point hitch mount. *Mounts sold separately.